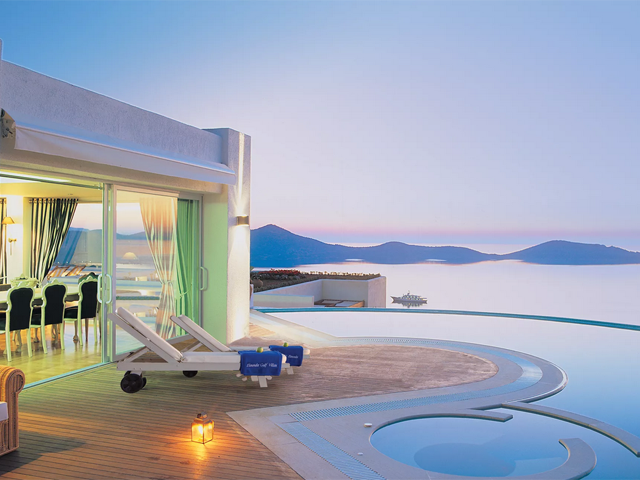 The Domes of Elounda, All Suites and Villas Spa Resort, is situated in the international renowned hot spot of Elounda. The resort consists of eighty suites, eight private residences, three villas and a royal villa that represents not only the beauty of the Mediterranean, but also depicts the Cretan culture. The medieval monument of Spinalonga, as well as the historic tradition of Byzantium, shed the light of inspiration for the architectural design of “Domes of Elounda”. The architectural philosophy behind the designs of Domes of Elounda All Suites and Villas Spa Resort is monumental for the use of domes and pyramidal roofs, earth color of the building materials, combined in harmony with the unique Mediterranean light and a distinctive approach to the use of volumes and space. 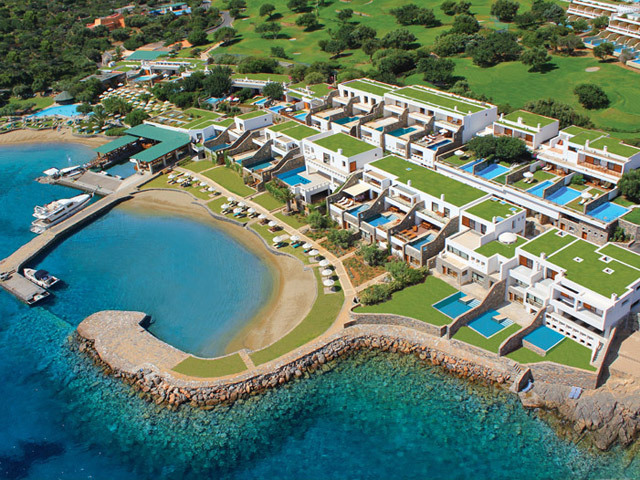 The result is a unique resort development with autonomous residential units, which manages to integrate a unique resort complex of the highest standards that fits in harmony with the landscape of Crete. Moreover, the area’s stunning views of the gulf of Elounda, the traditional town of Elounda, and the medieval castle of Spinalonga give the chance for a luxurious getaway. 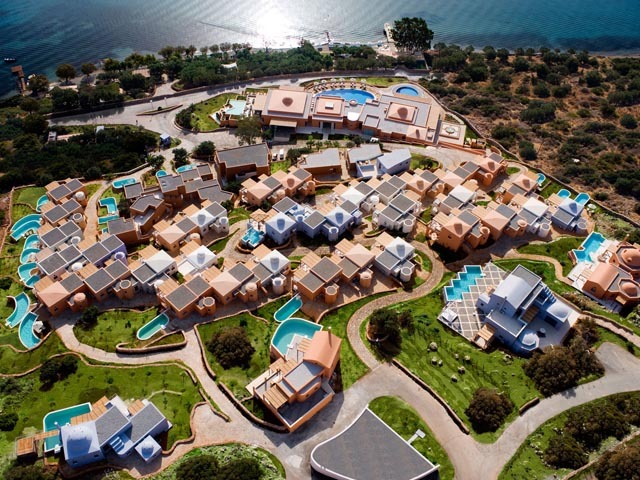 In front of the resort lies an approximately three-acres lush area, which opens onto a private sandy and well protected from the streams beach, that offers a surplus of choices to keep you by the sea water with a stunning view of the Spinalonga. The emphasis on the area’s natural riches and the resort’s sophisticated architecture create an impressive environment that will surely take your breath away. Physical beauty along with the high level of luxury services tailored to each visitor’s personal needs, fashions an unprecedented vacation that must be experienced by all. The journey begins now... New concept, new luxury, new architecture, new design. At the southernmost point of Europe, Crete has long been the meeting point of the people of the Eastern Mediterranean and the historic crossroads of great civilizations. Studded with memories and the visible remnants of history, with an ages-old tradition of hospitality and warmth, the island embraces the visitor from the first moment. 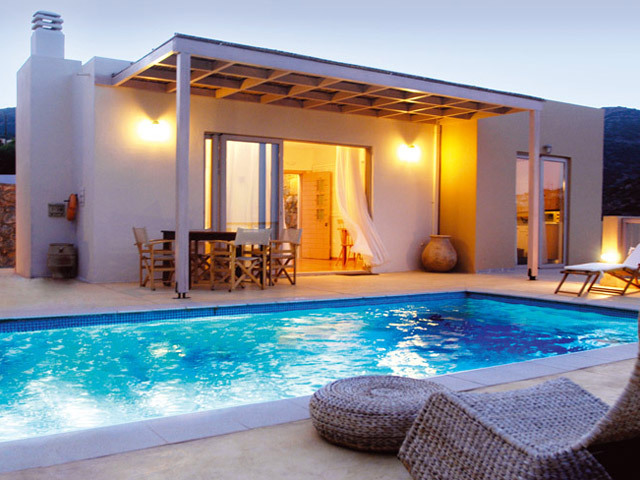 Blessed with an ideal climate and extraordinary natural beauty, Crete is the perfect place to live for those who choose to settle in this truly fascinating part of the Mediterranean. 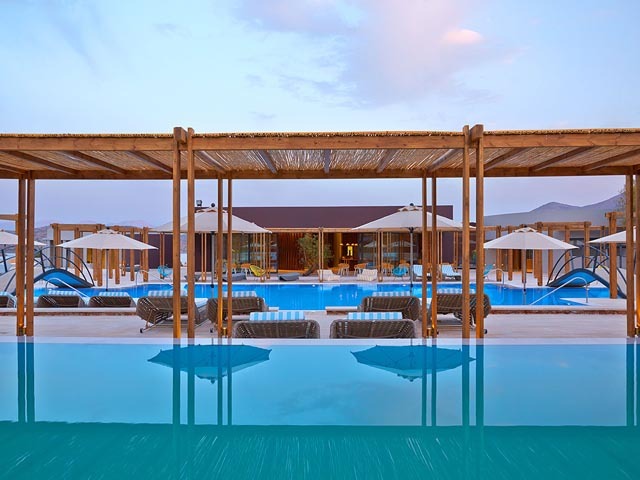 Elounda, where the Ledra complex of luxury residences is located, lies just 11 kilometres from Aghios Nikolaos and 75 kilometres from Iraklion, the business and administrative centre of Crete . The area is famous for its quiet, rocky coves and secluded, pristine beaches that dot the coast. The seaside village of Elounda stands in a tranquil bay with a view to the islet of Spinalonga and its medieval fortress. Today, it has become one of the most cosmopolitan vacation resorts in the entire Mediterranean, much loved by Greeks and foreigners alike. Luxury and high quality services are combined with their basic principle: Each guest is unique! Additionally, there is a main building, easily accessible from every suite, which houses the reception facilities, along with a fitness centre, swimming pools for children and adults, a spa and two restaurants. Here, you will find anything you desire with a simple phone call. 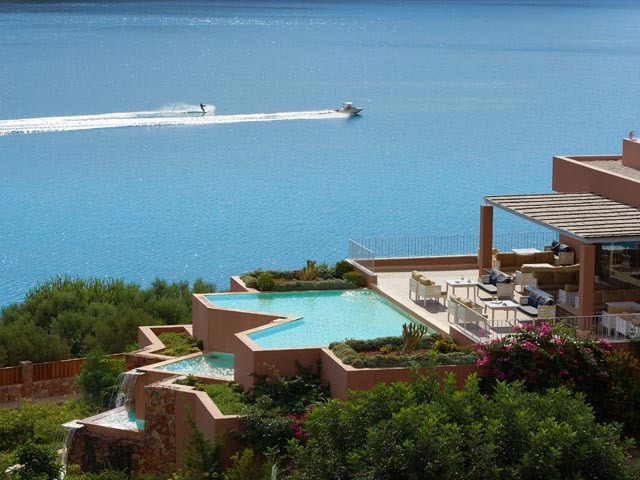 Each suite enjoys an unimpeded view of Elounda Bay and the medieval fortress of Spinalonga. 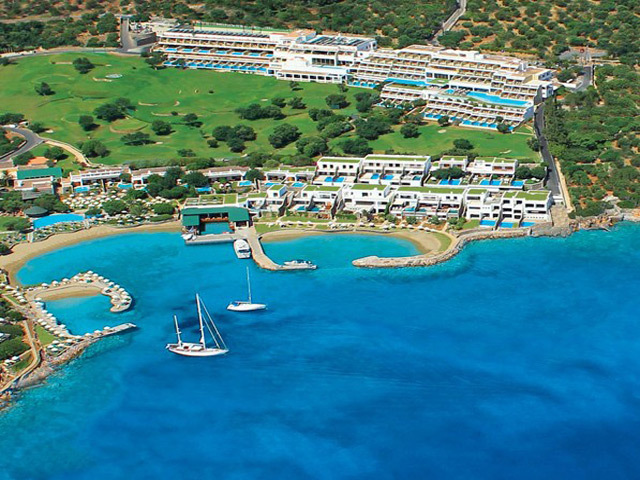 In front of the hotel is a lush area of 1.5 acres which opens onto a beach with a stunning view of Spinalonga. 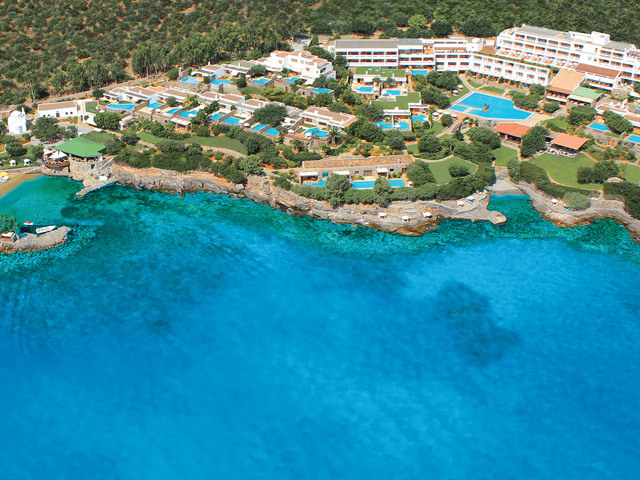 On the beach itself you will find a fish taverna offering local dishes. 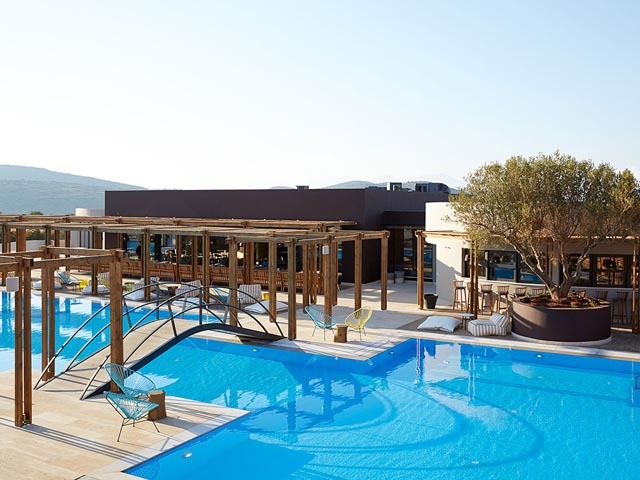 The luxurious “Milfey Spa Center” which is located at the Domes of Elounda, offers you a combination of unforgettable holidays, complemented with revitalising treatments, able to eliminate the tension and indulge you body with full energy. The well trained professionals of “Milfey Spa Center” practices the most efficient methods and techniques that will restore the balance of your body, the regulation of your metabolism and the elimination of the effects causing stress. “Milfey Spa Center” is a space of calmness, relaxation and beauty treatments where time stops. Dining at one of the four restaurants at Domes of Elounda is a culinary experience itself. 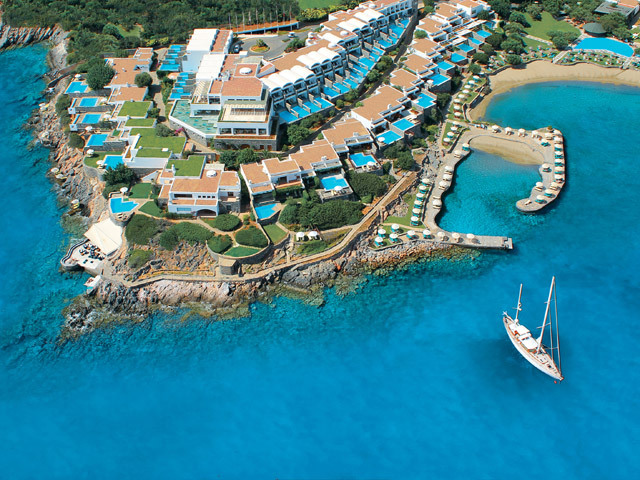 Whether you are looking for a casual beachside setting, Cretan Gourmet light meal or intimate romantic dining for two, the resort caters for all requests and desires. A spectacular variety of gourmet fish, Cretan, international and Mediterranean cuisine is presented on signature menus that define each restaurant. In addition, 24-hour room service is available to all guest suites and villas, for ad-hoc dining pleasure. The selection is unlimited, whatever the guest’s desire might be. The Pier 1910 – Exclusive! 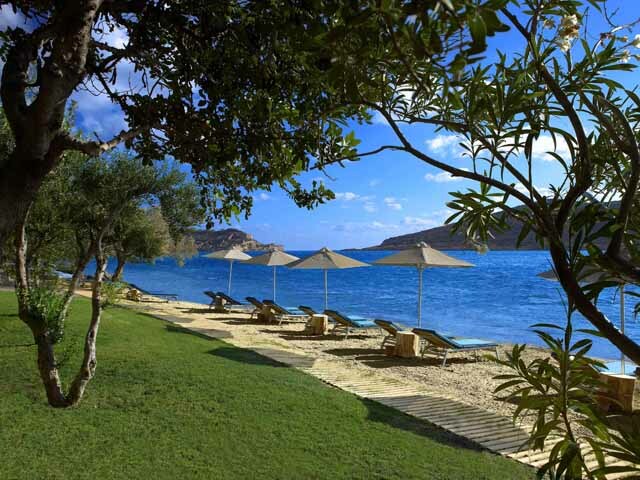 Domes of Elounda offers a dining journey with authentic gourmet experience. Also you can take a dip and refresh with a cool drink or a hot shot in Dome’s Bars. Either the Grand Dome live music bar, or the Spina jazz bar under a canopy of stars and sea breezes, give the opportunity for really groovy days and... nights.